I’m sure you heard about gaming keyboards, gaming mice or gaming monitors, hell, there’s even gaming furniture available (chairs, bean bags and desks), but have you heard about gaming switches? No, well, then you’re in luck because the Netgear Nighthawk S8000 (also known as GS808E) is actually a gaming switch (the first of its kind), which indicates that the manufacturer is crossing its fingers in hopes that this device will pave the way to a new successful niche. Ethernet switches have been around for a while and most people have at least a basic idea about the use of a switch in a networking environment, but, what is an Ethernet gaming switch? Well, it has a way better design than the regular switch, it comes with QoS (acts as a basic managed Gigabit switch) and the user interface is optimized for mobile devices. That being said, let’s have a closer look at the Netgear Nighhawk S8000 and see if you would actually need it in your home? The Ethernet switches are usually designed to be mounted on a rack and be a part of a business environment, so the industrial look is a natural consequence and, since these devices weren’t needed for a long time in a home network, there was no incentive to change the plain, but functional look. 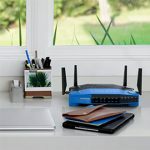 Since the technological development has added more and more devices to our homes, the four ports of the regular router aren’t enough anymore, so the consumer market has been slowly including the Ethernet switch as part of a home network. 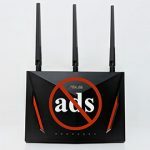 I know we may not like to admit it, but the look of a device, be it a networking product or not, is an important factor that we take into account before we make a purchase (this is one of the reasons why the usual router loses ground over the newer and better looking WiFi systems). 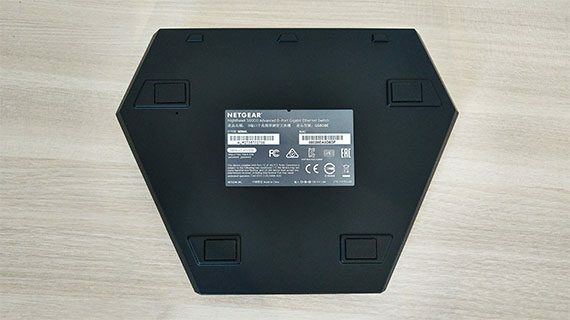 And this highlights one of the strong points of the Netgear Nighthawk S8000, because the manufacturer steered clear of the plain rectangular box design and decided to create a hexagonal-shaped case made of zinc alloy and covered it by a black matte finish (which is soft to the touch and doesn’t retain fingerprints) – the bottom side seems to be made of hard plastic. The S8000 resembles a miniature spaceship, featuring angular lines and sharp angles (to go along with the routers from the Nighthawk series), but I was quite surprised to see just how small the device actually is. I know that there is a new trend to make the switches as small as possible, but the S8000 is one (if not) the smallest 8-port Ethernet switch available on the market (it measures 7.7 x 5.9 x 1.6 inches). Regardless of its size, the S8000 is a lot heavier than it looks (1.63 lbs), so, even if you use all the port to connect wired clients, the device won’t budge (also thanks to the four silicone feet). While most other rectangular Ethernet switches can be mounted in a rack (even if they’re smaller), the shape of the S8000 won’t allow it, so, you will have to use a tray. Furthermore, you also can’t mount it on the wall, the only position available is on a flat surface. The top of the device is divided into four sections and the front area is slightly lower to make space for a subtly placed blue Power LED light (can be turned off by activating the Stealth Mode), while towards the rear side, there are eight LED indicators positioned directly on the edge: solid blue indicates a healthy connection to a powered-on device, while blinking blue indicates traffic, but, if all the port LEDs are flashing red in a scrolling pattern, then you need to wait for the firmware to be loaded; if the port LEDs are blinking fast a blue colour, then the device has detected a network loop. 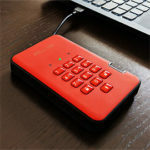 On the rear side of the switch, immediately underneath the LED lights, you can find eight Gigabit Ethernet RJ-45 LAN ports, a LED On/Off button and a 12V, 1.0A DC power connector (a small recessed Reset button can be found on the bottom of the device). 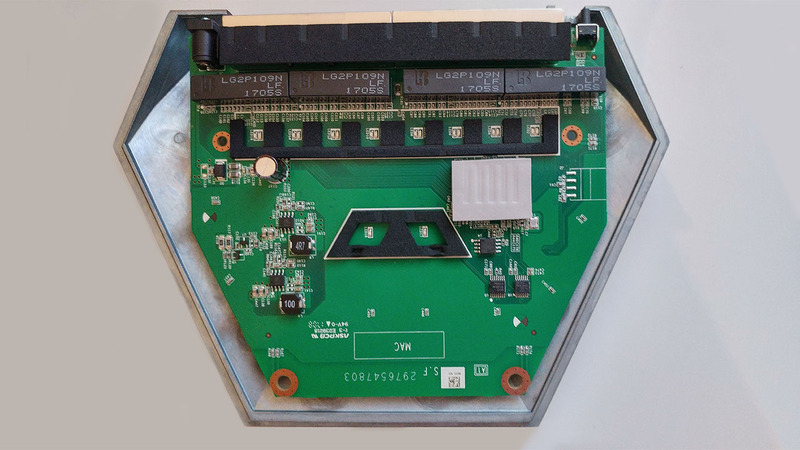 Bear in mind that some of the ports have a specific role: it is advisable to connect any gaming device to the first port and, if you have a streaming device, it is better to connect it to the second port. 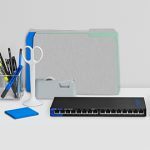 Furthermore, the eighth port is suitable for connecting the switch to a router, while the ports 3 to 7 are suitable for other types of networking devices. 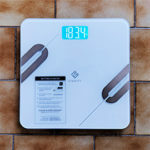 If there is one design shortcoming to point out is the fact that there are no cut-outs anywhere around the case to facilitate a proper heat management. Sure, this is not a PoE device (although, considering the price tag, I wouldn’t have complained), so it can easily rely on passive cooling, and when multiple devices get connected to the switch, it does get slightly warm, but it doesn’t overheat (it is still advisable to keep the device in the open – it will look cool on your desk, so don’t worry). On the bottom side of the switch, you can find a label with important info about the device, such as the Serial number, MAC address, the default IP address, as well as the password for the web-based utility. After I opened the case, I understood why the switch weighs that much: it is because of the seriously thick zinc alloy top part; and it also made it more clear how the ‘cooling system’ works: there’s a pad on top of the chipset which touches the alloy for a better temperature management. For that reason, I couldn’t see what chip Netgear added on its Nighthawk S8000, but I could spot a MXIC MX25L3233FMI-08g 32Mb CMOS flash memory and four x LG2P109N LF 1705S Dual Port Module 1000 Base-t LAN. Note: The Nighhawk S8000 features a switching capacity of 16 Gbps. 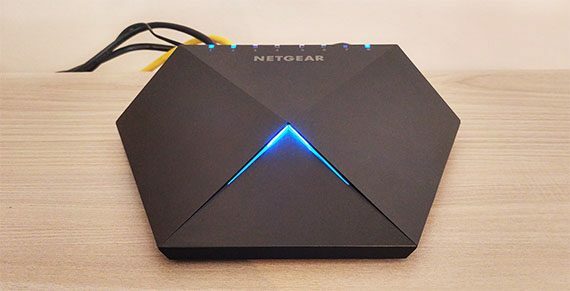 It’s clear that the design is going to turn heads, but the Nighthawk S8000 needs to do more than the usual unmanaged switch in order to justify its ‘gaming’ attribute. Thankfully, it does offer some interesting features and maybe the most important one is the QoS prioritization. 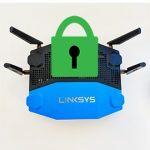 This feature has the role of selecting what you deem to be the most important content in your home network and delivering it to you a lot faster than any other application or service available on your LAN (of course, QoS will work in case of network congestion, otherwise, high or low-priority devices will be treated equally). The S8000 features three Preset Modes, the first is suitable for Gaming (port 1 is optimized for gaming and port 8 for uplink), the second for Media Streaming (where port 2 will be optimized to work with media streaming devices) and the third is for Standard use (where every port is treated the same). The user can also manually choose between port-based QoS (the default option) or 802.1p/DSCP, the latter functioning a bit different since instead of focusing towards prioritizing devices, it will create priorities based on the type of traffic that enters the switch. There is also the Broadcast Filtering feature which, when enabled it helps prevent broadcast storms (it limits the number of broadcast packets that are being sent by each port). But, do you actually need QoS on a switch in a home network? No, yes, it depends. 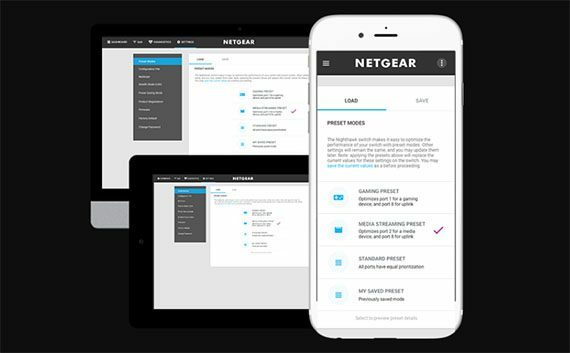 Netgear has embarked into a battle on two fronts, from one side, there’s the (gaming) router and from the other, there are the ‘regular’, non-gaming Ethernet switch. Let’s get one thing straight, you do not necessarily need QoS if you only have a tablet and a smartphone connected to your home network, the prioritization becomes a need when you have a larger number of clients which, when connected, some of them can hog all the bandwidth. 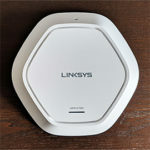 Now, a decent router will most likely have QoS added to its set of features by default (some don’t or have a very basic type, such as the Google WiFi) and, if you want more ports, then you need an Ethernet switch. 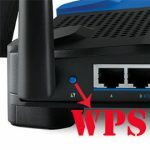 So, if you have multiple consoles and gaming PCs connected to the network, then a switch that support QoS is a godsend and it nicely complements the functionality of a router (most routers come with four Ethernet ports (the latest WiFi mesh system with even less), so an extra of six ports is definitely a welcomed bonus). 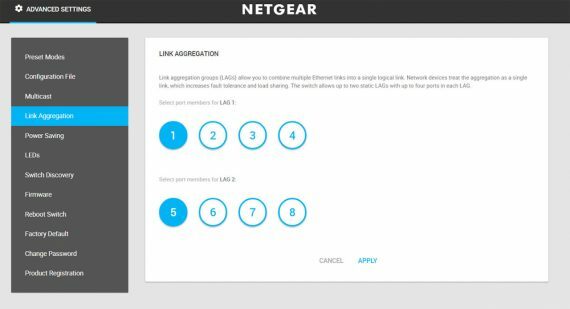 Another feature that enhances the cooperation between the S8000 and a router is the link aggregation (LAG), which, when used with a compatible router, it can increase the fault tolerance and the bandwidth up to 2 Gbps (this is only over LAN, it will not increase the Internet speed you get from your ISP). The switch supports up to two static LAG connections and up to four ports for each LAG. 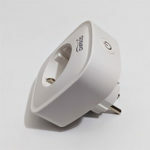 When compared to the regular ‘lightly managed’ switch, such as the devices from the Netgear ProSafe series, things get a bit more complicated, because if, for example, we take the much older GS108Tv2, you’ll notice that there aren’t that many differences from the features point of view (you get advanced QoS, link aggregation and, additionally, the ProSafe series also offers VLAN for traffic control), but I suppose the better casing, the unique design and the mobile-friendly interface could justify the price tag? In order to access the user interface, you need to know the IP address of the switch and, in my case, my router overwrote the default IP address, so you may need to check out the connected clients in the router GUI to see which IP was assigned to the S8000 (it is advisable to set a static IP address to the Nighthawk switch for an easy access – if not, the router will assign it a new IP every time you restart the switch). The first thing you need to do after gaining access to the UI is to check for any new available firmware updates and immediately install them (to do so, you need to go to Advanced Settings > Firmware and upload the firmware file). After that, you can explore the interface and configure the switch. The Home section shows general stats about your switch, such as the Port Status, the System Info and the number of connected Ports, but it also allows you to disable the LED indicators and turn on or off the DHCP. The Prioritization section is pretty straight-forward, allowing you to choose between the two aforementioned QoS modes and, depending on the mode, you can either edit the priority and/or set the rate limits. The Diagnostics section allows you to test the cable connection and, in case it detects a fault, it will tell you the distance from the switch. 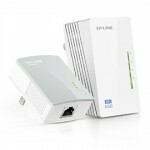 The Advanced Settings consists of multiple options: Preset Modes (Gaming, Media Streaming and Standard), Configuration File (restore or Backup), Multicast (IGMP Snooping, Block Unknown Multicast Address, Validate IGMPv3 IP Header and IGMP Snooping Static Router Port), Link Aggregation, Power Saving, LEDs, Switch Discovery (UPnP, Bonjour and NSDP), Firmware, Reboot Switch, Factory Default, Change Password and Product Registration. Note: I suppose, Netgear could have been a little bit clear about what every feature does, since the audience is different than the small to medium businesses, but then again, the switch is configured out-of-the-box and will work with most types of networks by default. 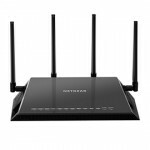 I keep complaining about the plain look of most switches, but the Netgear Nighthawk S8000 is definitely the best looking Ethernet switch out there and it is one of the few to challenge the traditional design of the regular Ethernet switch (along with Ubiquiti’s ToughSwitch TS-8-PRO). Obviously, the design is not enough to persuade people that they need this device, but fear not, because the S8000 comes with every feature one may expect from a lightly managed switch: QoS, link aggregation and an easy to use interface. 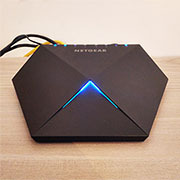 Obviously, this is not a device suitable for everyone, but, if you have a larger network with lots of devices connected, from which some are dedicated for gaming and 4K streaming, then the Nighthawk S8000 is definitely worth taking into consideration.